I have European Nightcrawlers in an 18 gal. tote (with lots of holes! ), inside another tote for about 2-3 weeks. All is well, not much leachate, strong "earthy" smell. It looks like castings are beginning to come from the holes on the bottom, not in any quantity, but enough to fall into the leachate bin when they can't stick to the bottom. This makes me ask- How do I know when to add a second bin? when to harvest castings? Could I just keep going along adding small amounts that disappear over several days, while others hang around, until the bins finally overflows? This setup is portable enough, but I still will need to figure out the best way to harvest the castings. My hope is to keep the operation (bins, harvesting, tea brewing, etc...) confined to the smallest area possible. Thanks for writing in and asking a great question. I get this question a lot "How to harvest worm castings & "When to harvest worm castings". I will write a more in-depth page on this soon. Well I'm not sure what you are doing with your totes. Are you stacking them like trays or just using one for all your needs? I understand you have two but one is really only for housing your worms and the castings. Let's just assume you're using one tote and putting food in as the worms need it. In this case you would, when you feel you have enough castings to harvest, stop feeding your worms. This allows the worms time to turn most of the compost into castings. When you feel that you have about 95-99% castings remaining in the system then you are ready to harvest. This involves dumping all the contents onto a working table where you would use light (or the sun) to help you harvest the worm castings. As you collect the worm castings from the top the worms wiggle their way down out of the light leaving nothing left but rich castings to harvest and a squirm of worms left when you're finished. Don't collect all your castings as you'll want to leave some behind for bedding and it makes them feel a little more at home. The key to knowing "when to harvest worm castings" is pretty simple though but very important. Always remember that you don't want to see any compost (the bits and pieces of food mixed with castings). It should be 95-99% castings. It will never be 100% casted. You don't want to feed your plants the material that is still breaking down as this can contain unbeneficial microbes and potentially harmful microbes for plants. 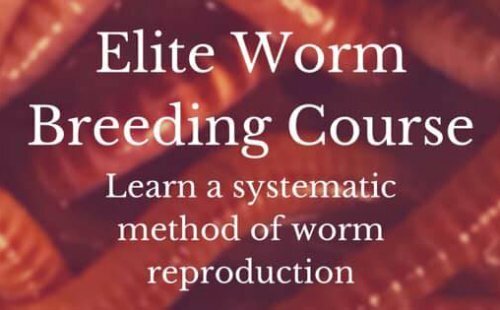 A trick for sifting through as few worms as possible is to feed them their favorite foods in one little corner a few days before you harvest the worm castings. They will migrate to the food leaving the rich dark humus to harvest. If you're using the totes in a stackable manner, then you're ready to put another one in when the castings reaches the bottom of the next tote. This will allow the worms a way up into the next bin, providing you have holes drilled in the bottom. You don't want to let the bins fill too high (to the top) as the worm castings will become too compact, wet and not aerated properly. The best way to worm farm, in my opinion is to get a Worm Factory or the Worm Inn. Much less hassle than a plastic tote. But we all start somewhere. This was where I started and plastic totes are great trainers. As a matter of fact some people still use them for commercial worm farming.